Rods: 7 to 9 weight rods are ideal. 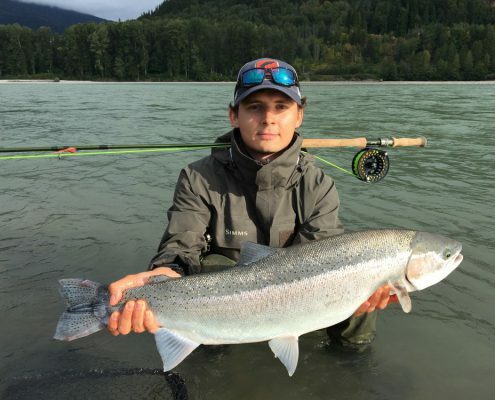 Single-handed, switch and double-handed rods are all used in the Skeena region. Line: Shooting heads with loops or weight forward lines with interchangeable tips. 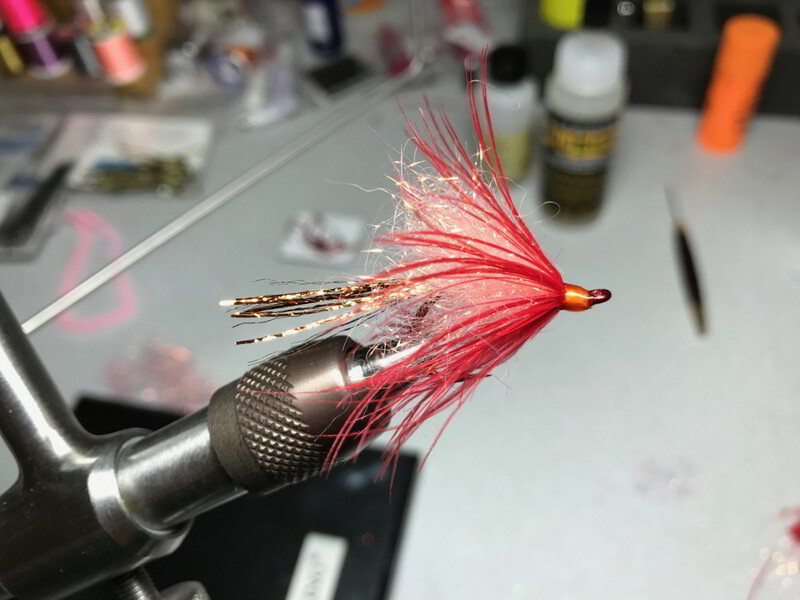 The Skagit’s are popular with the Spey casters for casting the larger sink tips and flies. Leaders/Tippet: Anglers can use a variety of sink tips such as Type 3-8 sink tips 10 to 15 feet or Mow-tips from T8 to T17. For Mow tips a variety in light, medium, heavy and extra heavy in 10-12.5 should cover most water conditions you will encounter. For some water you can also use the Mow tips with a floater and short sinking tip for getting behind larger rocks. 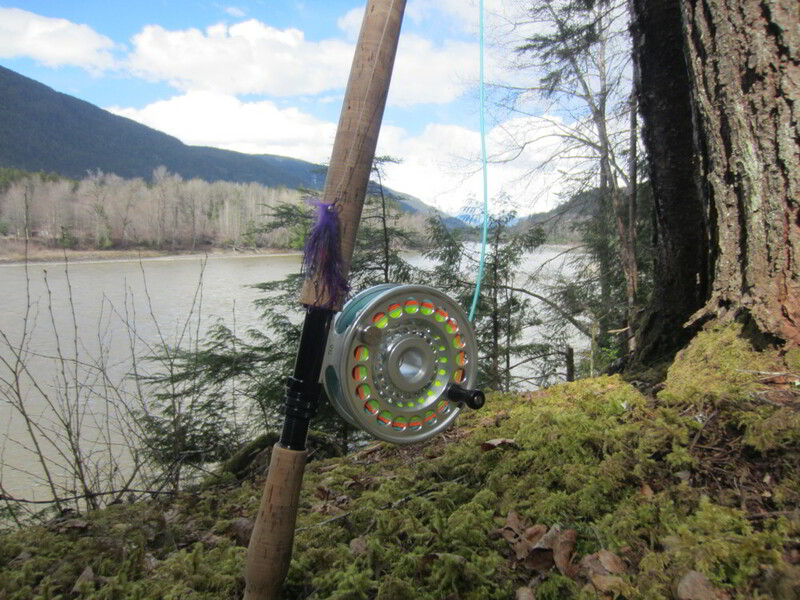 15 and 20lb tippet is recommended. If you are using monofilament we recommend Maxima. Flies: A number of patterns work well for Steelhead and salmon – e.g. Intruders, Pick ‘Yer Pockets, leeches, shrimp patterns and Popsicles, just to name a few. Favorite colors are Black, purple, blue, pink, orange and chartreuse. Single barbless hooks are mandatory. For most conditions a size 2 hook works well. Flies are available at the lodge. 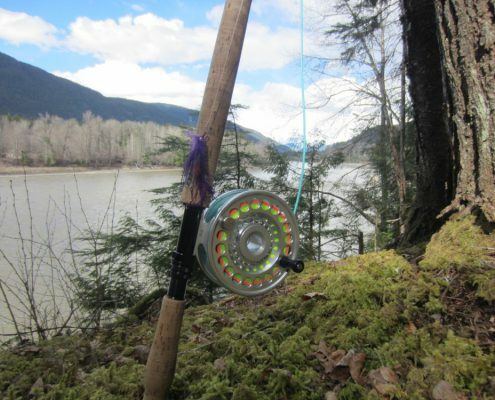 Most anglers bring their own fishing equipment. For those guests that do not have suitable fishing rods or tackle, the lodge can supply any equipment required. The lodge a full range of equipment including Spey rods, switch rods, single handed rods, spinning rods, reels and lines which guests may use during their stay. 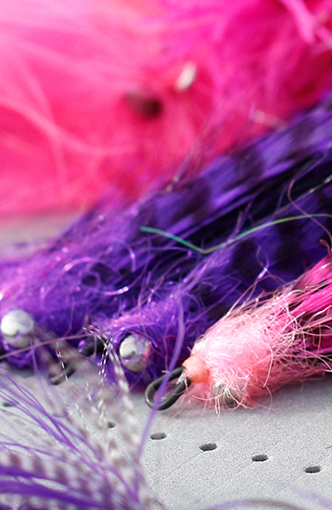 Terminal tackle including flies and lures are available at the lodge. 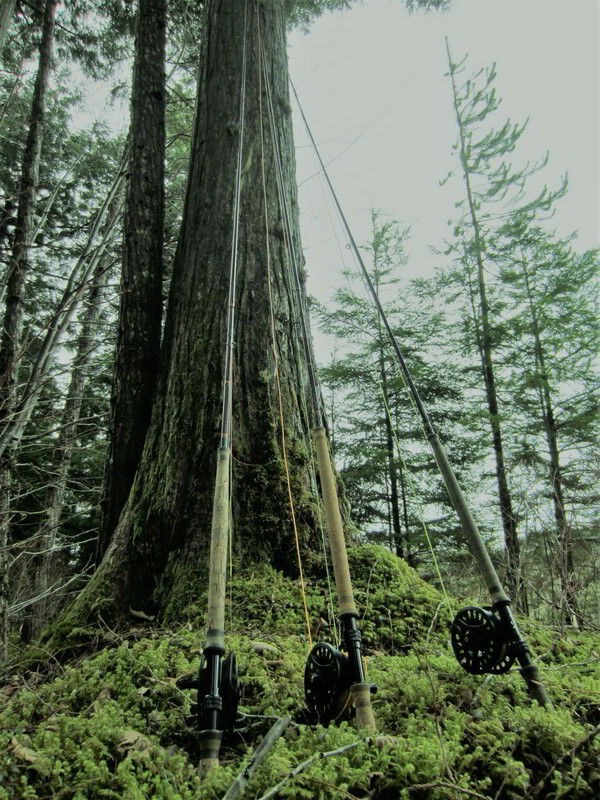 Loss of or damage to any of the lodge’s fishing equipment is the responsibility of the guest. Chest waders are recommended – felt or Vibram soled waders or boots are preferable. Studded boots are generally not required on Skeena region rivers. Guests who like to use cleats/studs in their boots are asked to bring over shoes for their boots or to use an interchangeable sole system such as Korkers. Warm clothing is recommended as even in the summer temperatures can be variable. Layers work well as you can add or remove accordingly. Please ensure you have appropriate wet weather gear i.e. a good waterproof coat.